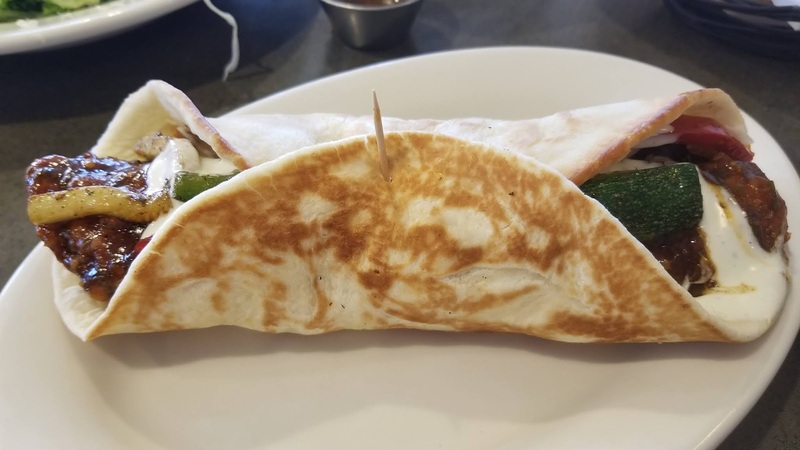 This past weekend, I was in Novi for the Motor City Comic Con, which provided the perfect excuse to drop by Olga's Kitchen - their Novi location is about a mile down the road from the Suburban Collection Showcase where the convention was being held. The purpose of my visit was to try the new limited time offer items—A Taste of the Far East is the theme. These include a citrus iced tea, Sweet Heat Asian salad, Korean Crispy Chicken Olga, and Coconut Olga Bread Pudding. I started off my meal with the Citrus Lemongrass iced tea, which was refreshing. We also ordered the Sweet Heat Asian salad to share, and we enjoyed that before our entree sandwiches. 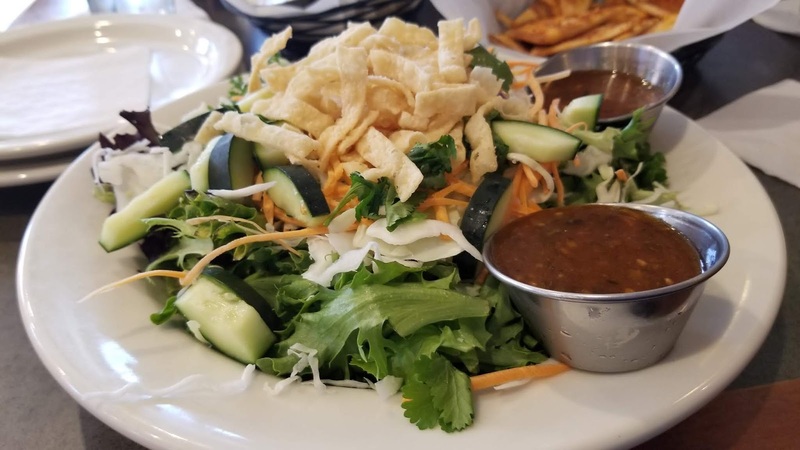 The dressing that comes with the salad—a housemade Korean BBQ vinaigrette—had a mild spice to it, and was delicious. If you haven't been to Olga's before: you absolutely HAVE to order Snackers, which is one of their most well-known appetizers. It's basically seasoned slices of pita bread, served with a Swiss Almond cheese spread ... and it's delicious. We definitely ordered one of the Snackers baskets to start, as well as their zucchini fries, both of which I enjoyed. 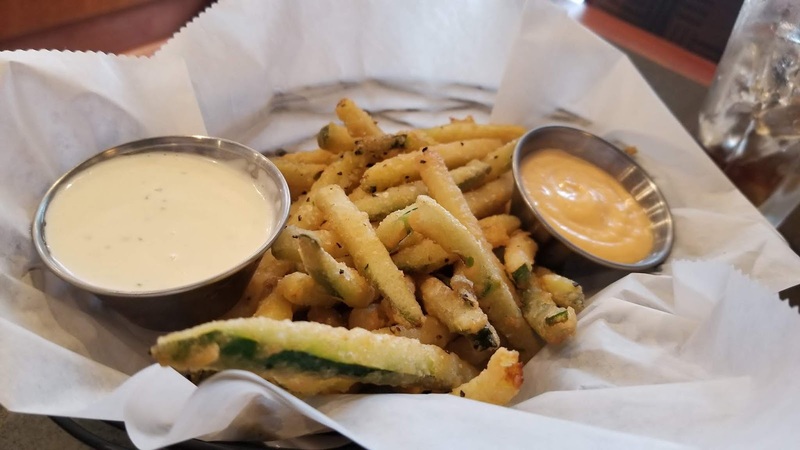 The zucchini fries came with two dipping sauces, one of which was a slightly spicy horseradish-type sauce, and the other I think was a buttermilk ranch. I liked both of them but the buttermilk ranch was quite delicious. I tried out the Korean Crispy Chicken Olga for my main entree, and really enjoyed it. The sandwich includes "crispy breaded chicken tenderloins tossed in a sweet and spicy Korean style BBQ sauce with shredded cabbage, sautéed fresh vegetables, and finished with a buttermilk ranch dressing." For dessert, we were each treated to a Coconut Olga bread pudding. 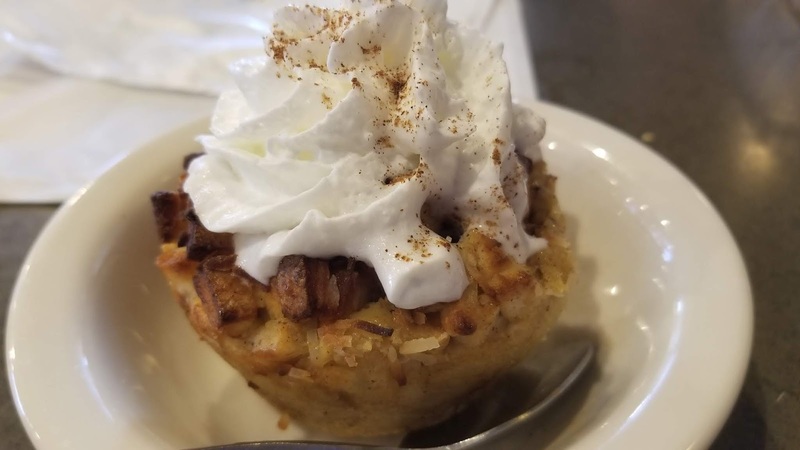 I'll admit that I'm not a big bread pudding fan, but I really liked the coconut in this version—the coconut combined with the whipped cream topping was very good. Thanks to the Novi location for hosting us - everything was delicious! 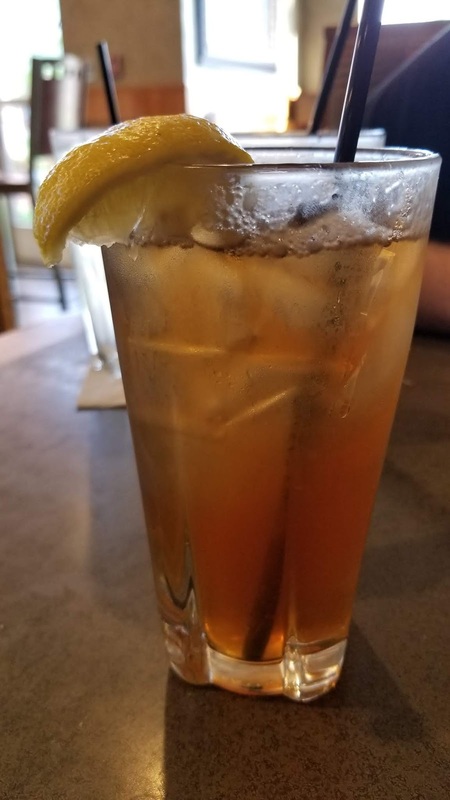 Click here to see a list of all of the Olga's Kitchen locations. Enter to win via the widget below. Giveaway will end on Tuesday, May 29th, at 11:59pm EST, and winner will be notified via email the next day, and have 24 hours to respond, or an alternate winner will be chosen. Must live in Michigan to enter this giveaway.